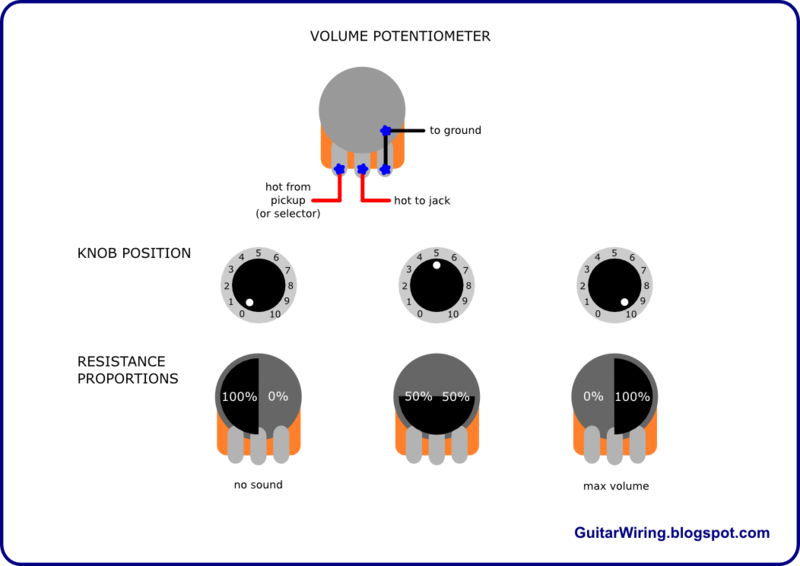 The Guitar Wiring Blog - diagrams and tips: How a Guitar Volume Potentiometer Works? How a Guitar Volume Potentiometer Works? Every pot used to control guitar's volume is basically a voltage divider. It's used to control how much resistance will be between the fist and the middle lug, and between the middle and the third lug. This system affects how much voltage will pass to an output. The diagram shows this thing according to knob positions. As you can see, the less resistance is between the lugs connected to the hot wires, and more resistance is between the hot path and the ground, the louder a guitar sound. When the volume potentiometer's knob is on „10”, a guitar signal has a clear way to go.